Can You Move It And Work It On A Treadmill Desk? : Shots - Health News Researchers and companies are bringing movement back into the office with treadmill desks, walking meetings and games. Employees say it has helped them lose weight and be more productive. 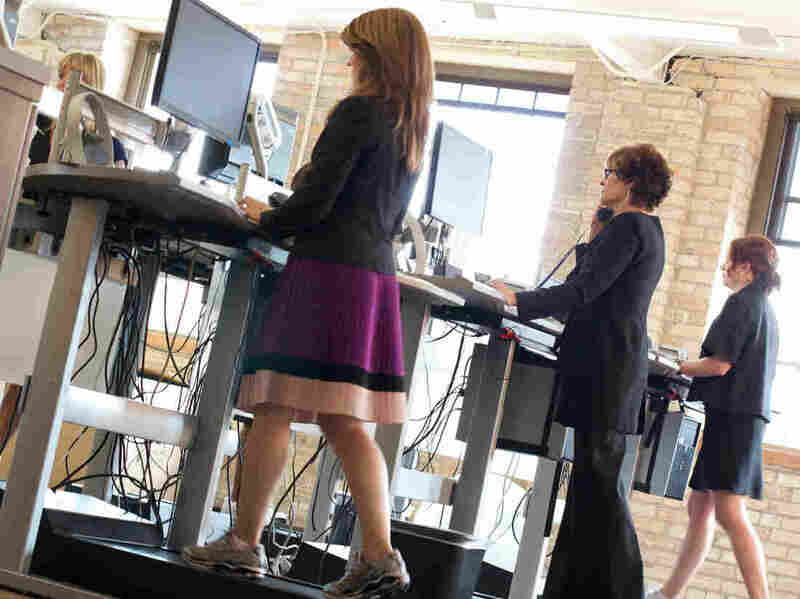 Employees at at Salo, a Minneapolis-based financial consulting firm, walk while working on treadmill desks. The firm offers treadmill desks for employee use and encourages an active workplace environment. I went about this in steps. First, I elevated my sitting desk to a standing desk. For about a month, I grew comfortable standing all day. Then I added a discreet treadmill (without handrails) under my standing desk, and voila — a treadmill desk. I'm into my second week now and walking at a pretty slow, casual pace, about 1.4 miles an hour. When I first started, I thought I'd simply hop on the treadmill and be off walking all day while working. But it turns out it's really hard to walk, talk, think and concentrate. James Levine, an obesity expert at the Mayo Clinic who came up with the idea of the treadmill desk, told me that my experience was pretty typical. "There's a tendency to want to jump on the treadmill and walk for hours and hours a day," he says. "Don't do that. Certainly, at the absolute maximum, do half-hour on, half an hour off, for two to three hours a day." That's a relief. That's about what I'm doing. Levine says that since the 1960s, work spaces have been designed to minimize movement. It's a culturally ingrained mindset, he says, which dominates much of our lives today. "You could literally spend your entire adult life from graduation to coffin entry without leaving your apartment, without getting up," he says. Levine is on a mission to get any kind of movement into the workplace and the workday. He's consulted with a number of companies nationwide to help them do this. The most popular activity by far, he says, is the "walk and talk" meeting. "They're generally shorter, more productive, and people don't fall asleep during walk-and-talk meetings." Take Salo, a financial consulting firm based in Minneapolis. The company has 12 treadmill desks, and encourages walking meetings and a mini-breakaway game — a mixture of pingpong, tennis and a bit of squash. Throughout the day, employees rotate on and off the available treadmill desks. Craig Dexheimer, Salo's director of operations and administration, loves his. He's lost 25 pounds since he started using it. If employees get distracted while walking, he suggests they stop or slow down the treadmill. A few years ago, Salo took part in a Mayo Clinic study headed by Levine to see what happened when employees used treadmill desks. The study was small — just 18 participants. For six months, they rotated on and off the desks, walking, on average, about three hours a day. Everyone lost weight. And overall, Dexheimer says, health improved. "Total cholesterol decreased, plasma triglycerides dropped on average 37 percent in total for all 18 participants. "Remarkable," he says. "We didn't even go to a gym. We just went to work!" And productivity didn't suffer. In fact, Dexheimer says, during the six months of the study, Salo's revenues were the highest ever. The environment, he says, was simply "more dynamic." Now, this doesn't mean a treadmill desk or a game of pingpong is for everyone. But even a little bit of activity is better than nothing, says Catrine Tudor-Locke, a researcher at the Pennington Biomedical Research Center. "Instead of sending e-mail to a colleague two doors down, try actually walking over to them," she says. As for me, I'm still getting used to my treadmill desk. I can write e-mails, read, have phone conversations. But I haven't yet written a story while walking. Levine and others say certain complicated or creative tasks are often still done best while sitting.